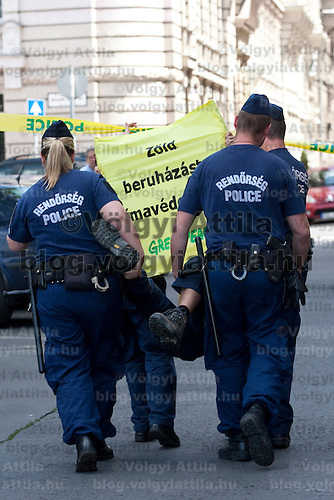 Hungarian policemen detain a Greenpeace activist during a demonstration in Budapest, Hungary. Wednesday, 17. June 2009. ATTILA VOLGYI Greenpeace activists protested against Hungary's sale of Kyoto emission quotas to Belgium and Spain last year for 100 million euros ($138 million) as well as Hungary's failure to begin the Green Investment Scheme, a plan which seeks to use emissions quota income to build more energy efficient, renewable and carbon dioxide reducing projects.